The dynamic range of visual stimuli appearing in the real world is extremely large and this holds for physically plausible synthetic images as well. However, conventional media used to present these images can only display a limited range of luminous intensity. This problem, i.e., displaying high contrast images on output devices with limited contrast, is a task of high dynamic range imaging and it is usually referred to as a tone mapping. Number of different tone mapping methods (or operators) have been proposed over the years. Since advantages and disadvantages of these methods are not immanently clear, we concentrate on a thorough and systematic comparison of tone mapping operators in this project. The field of tone mapping assumes extensive knowledge of findings from various scientific areas. In order to conduct a comparison of tone mapping methods, it is necessary to settle upon a set of image attributes by which the images produced by the methods should be judged. These attributes are not independent, and their interrelationships and the influence on the overall image quality need to be carefully analyzed. This is useful not just for comparing existing HDR approaches, but for evaluating of future ones as well. Fig. 1: An overview and the relationships between proposed image attributes. In scope of the project we have carried out several subjective psychophysical tests to prove the proposed relationship scheme. Moreover, we present the evaluation of many existing tone mapping methods with regard to the proposed image attributes. Fig. 2: HDR image of our real test scene after transformation using global tone mapping operator [Ward94] and local tone mapping operator [LCIS99]. We introduce a new gradient based High Dynamic Range Imaging approach and solution technique. Differently from earlier gradient based techniques we don’t compress or modify the original gradient field. It remains 'consistent' or 'conservative'. Instead the original gradient field we introduce and manipulate the 'Gradient Importance Field' containing weight factors in the objective function, which is minimized. Another important novelty in the new method is to apply lower-upper limitations of luminance, which ensures the prescribed contrast for arbitrary display devices. Fig. 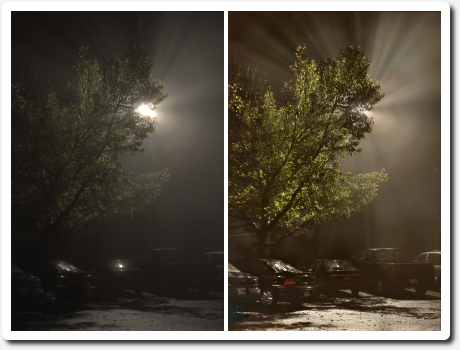 3: Comparison of the results of global tone mapping operator (left) and Gradient Importance based method (right). Čadík, M., Wimmer, M., Neumann, L., Artusi, A. 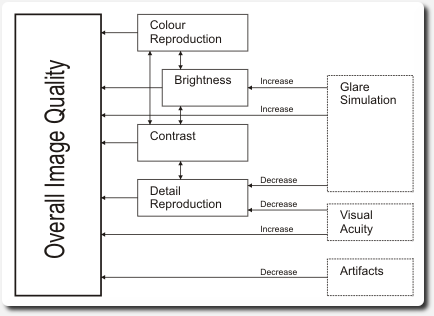 Image Attributes and Quality for Evaluation of Tone Mapping Operators. In Proceedings of Pacific Graphics'06, Taipei, Taiwan, 2006. Neumann, L., Čadík, M. Gradient Importance based High Dynamic Range Imaging. In Dagstuhl: Schloss Dagstuhl International Conference on Computational Aesthetics in Graphics, Visualization and Imaging, Germany, 2006. Čadík, M., Slavík, P. Evaluation of Two Principal Approaches to Objective Image Quality Assessment. In Proceedings of 8th International Conference on Information Visualization, Los Alamitos: IEEE Computer Society Press, 2004. Čadík, M. Human Perception and Computer Graphics. Postgraduate Study Report, Czech Technical University in Prague, 2004. Čadík, M. Evaluation of Tone Mapping Operators. Web presentation of the project, http://www.cgg.cvut.cz/~cadikm/tmo/, Czech Technical University in Prague, 2006.